WOW! These blocks are really lots of fun. But the wonky pinwheel!! What a lot of bias! That one looks like it would be really a challenge! Mary it was really easy and I did not have any bias problems that I remember!!! The wonky pinwheel is my favorite! So fun! You have been BUSY! So many pretty things… I love the tip on that granny square block- I made an entire granny quilt years ago from a print pattern, and the piecing was a pain. I might revisit it one day soon. I love the Granny Square block. It is so easy and so fabulous. I know there is another one in my future. I love the idea of increasing the size of the white squares on the edges of a granny square block. If only I’d learned that before I finished my top! 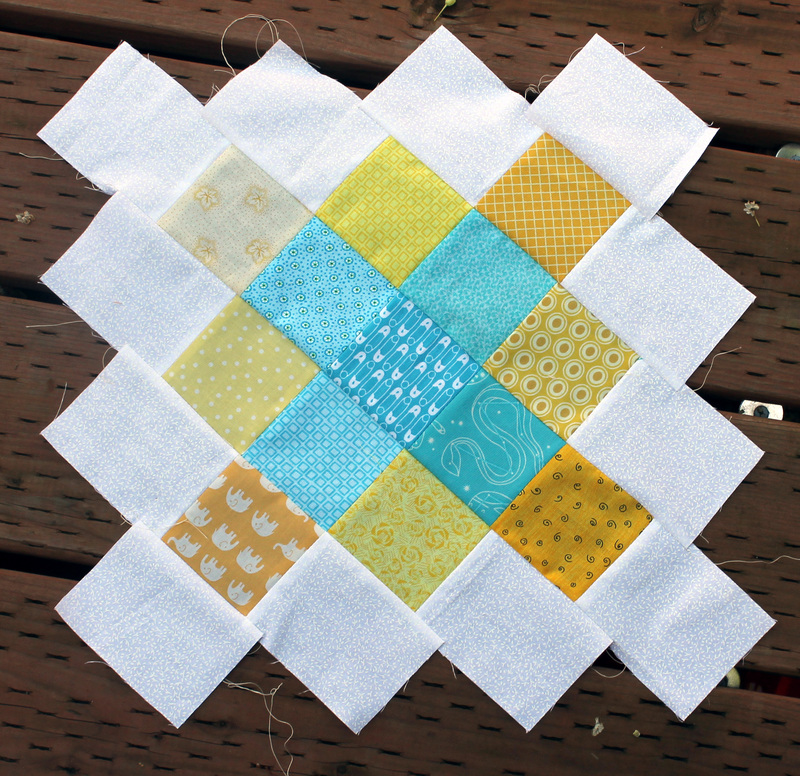 I know…My other granny blocks may be a little wonky because I did not have enough wiggle room. I haven’t seen anything on your Denyse Schmidt quilt for ages. Looking forward to a big reveal! Lovely blocks, all of them. You always have the best color combos, too! 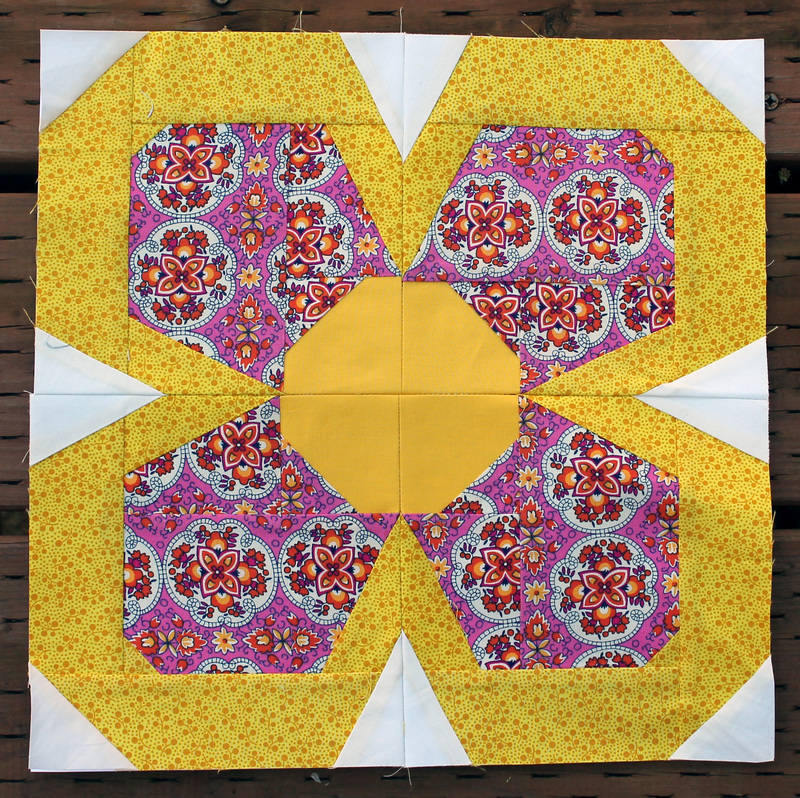 I’ve just made one of Ayumi’s flower blocks as a hand-quilting practice piece. I am loving it. I used Tanya Whelan fabrics for a very girly-girl look. 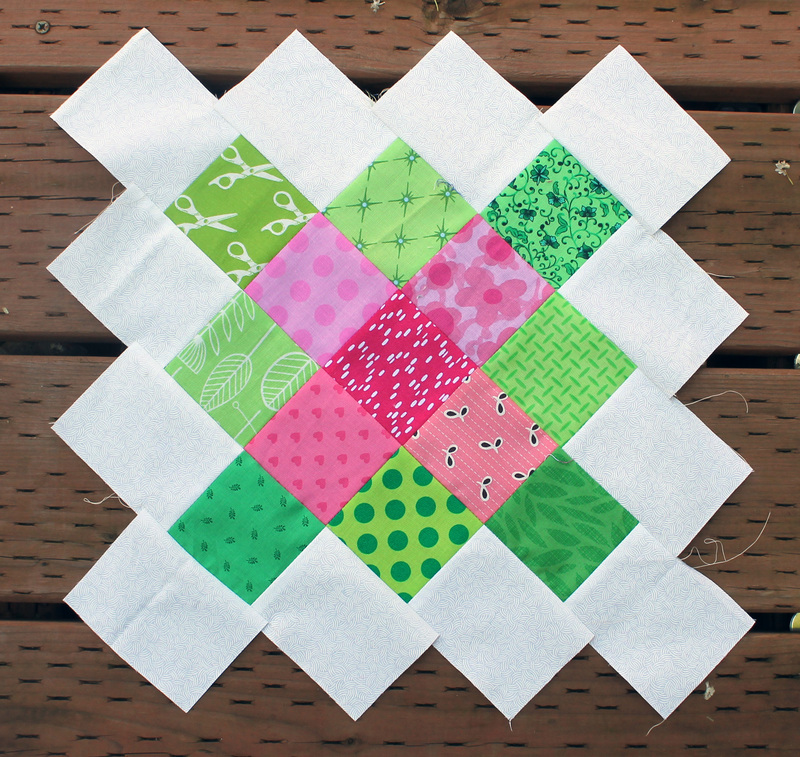 I think it might end up as a cushion cover for my goddaughter … if I ever finish hand-quilting it! Maybe one day I’ll make a whole flower quilt; they are very cute. Oh, all your blocks are so wonderful, especially the flower block! I’ve got to get myself going and make some ~ thanks for the inspiration! I actually thought a small flower using liberty would be fun… And very you. I love everything you have made. Your fabric choices are all perfect! So inspiring! Thanks so much. I really do enjoy playing with colour. Great comebacks from your sick days!!! I love what you are doing with Ayumi’s modern bloom! What a great idea, to make the white squares on the granny blocks a bit longer. Brilliant! 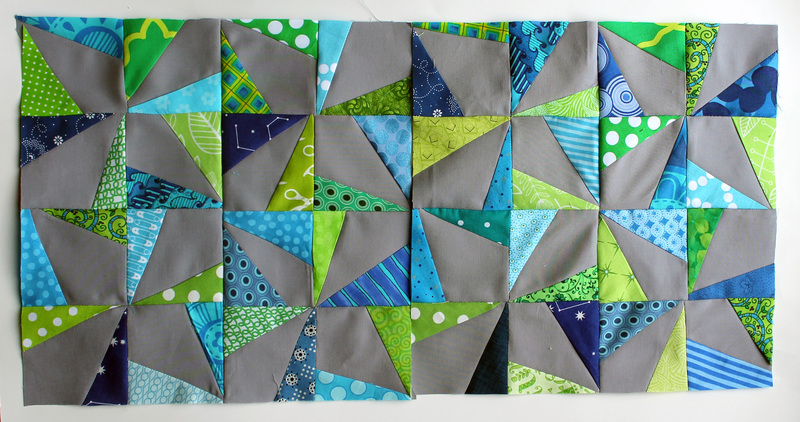 I’m working on a Bloom-time quilt too. They are so pretty, those flowers! That’s too funny! 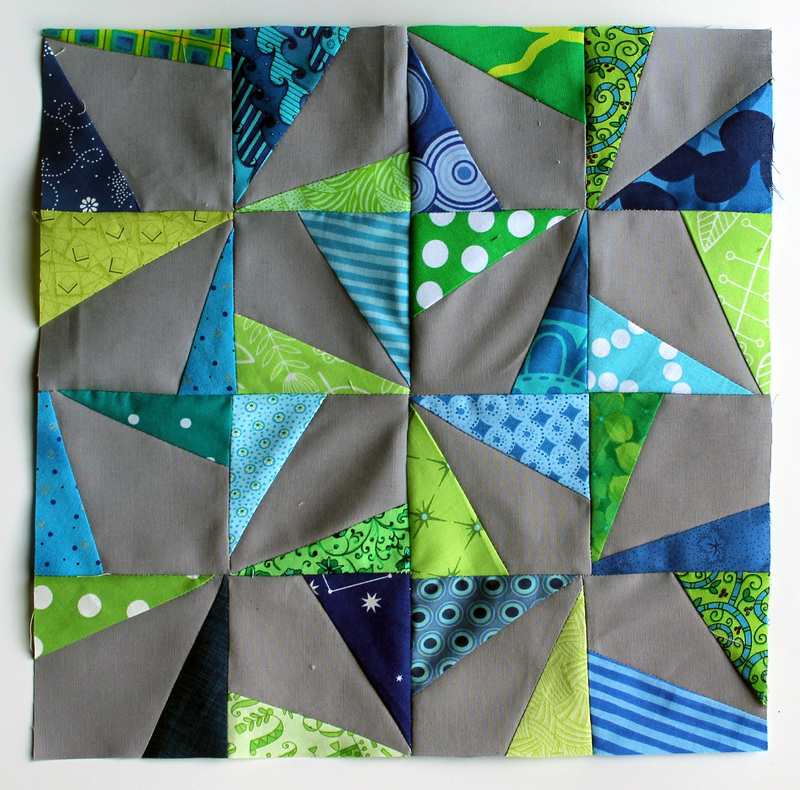 I was admiring the blue and green blocks when I realized it’s the very block (and suggested tutorial) that I have to make for my scrap bee this month!